Your Federal Poverty Level (FPL), as calculated based on your annual income, will determine how much you pay for health insurance. Your FPL will be used by the Covered California Health Insurance Exchange to identify if you are eligible for a subsidy and to determine the level of cost sharing that would apply, if any, for your Covered CA Plan. People whose income is within a certain range of the federal poverty level will be able to get reduced monthly premiums and sometimes, lower fees for medical services also. The “Federal Poverty Level” (FPL) is the measurement standard that the Department of Health and Human Services uses to determine if an individual or family is eligible for government-regulated programs and services. Federal poverty level amounts are updated annually and are commonly published by various government agencies. How do I qualify for reduced premiums and cost sharing? 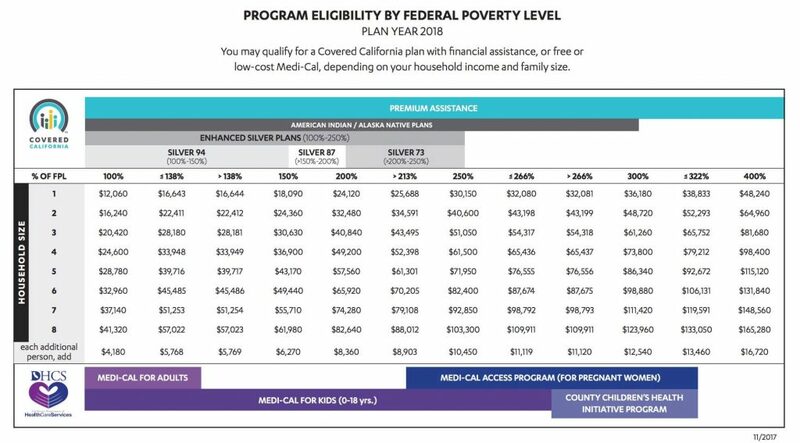 To qualify for a subsidy from the government, families must purchase their coverage through Covered California, and have a gross income no more than 400% of the federal poverty level. To also qualify for cost sharing reductions, your family gross income must be more than 138% and less than 250% of the federal poverty level. View the chart in the next paragraph to find what you qualify for based on your family size and income. How do I calculate my Federal Poverty Level? Determine what percentage your family gross income is compared to the federal poverty level. View the below chart for 2017 Covered California income limits. Step 1: Find your family size in the left panel. Step 2: Find your gross family income level. 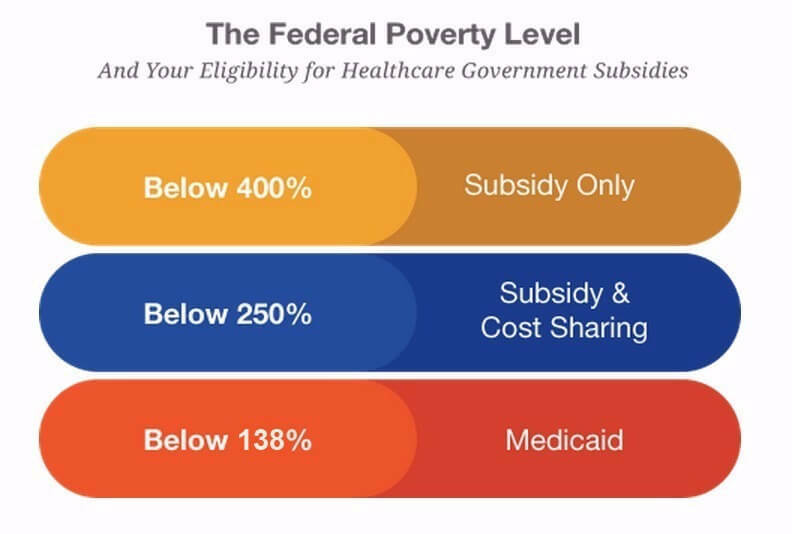 Step 3: Using Steps 1 and 2, look at the top of the chart to see if you qualify for Medicaid, Cost Sharing & Subsidy, Subsidy Only, or No Subsidy.